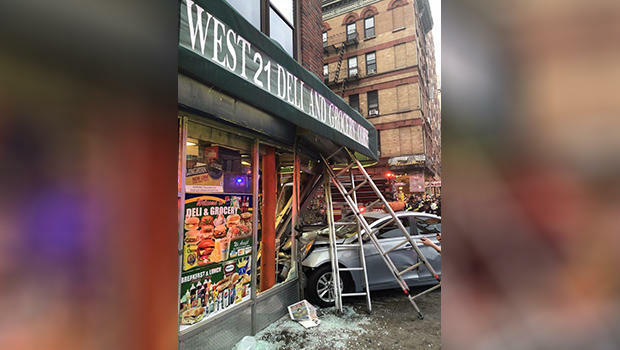 At least five people were injured when a car crashed into a New York City deli, the FDNY said. All injuries were non-life-threatening, and the victims were all taken to a local hospital. According to CBS New York, police said a livery cab jumped the curb after getting into a collision with a taxi cab, striking multiple pedestrians and then crashing into a deli. Police told CBS New York the victims included a 56-year-old woman and her 13-year-old son. "We saw one lady on the top of the hood and the younger boy, I think her son I'm not sure it's her son or not, also was crying there," a witness who works in a nearby pizza shop told CBS New York. "It was very hard actually, very sad." Police said both drivers remained on the scene after the crash.